Chop onion and garlics. Peel carrots and cut into small cubes. Cut brocolli into small flowerets and button mushrooms into wedges. Wash rice and strain water with a strainer and set aside. Heat frying pan with butter on medium heat, onion and garlic for 2 minutes. Then add in cloves, cummin seeds, cardamons, cinnamon sticks and curry leaves for half a minute. All the vegetables, turmeric powder and garam masala are then fry together with the spice mixtures in the pan for another minute before mixing in the washed rice. Season with salt and transfer to rice cooker with 2 cups of water. 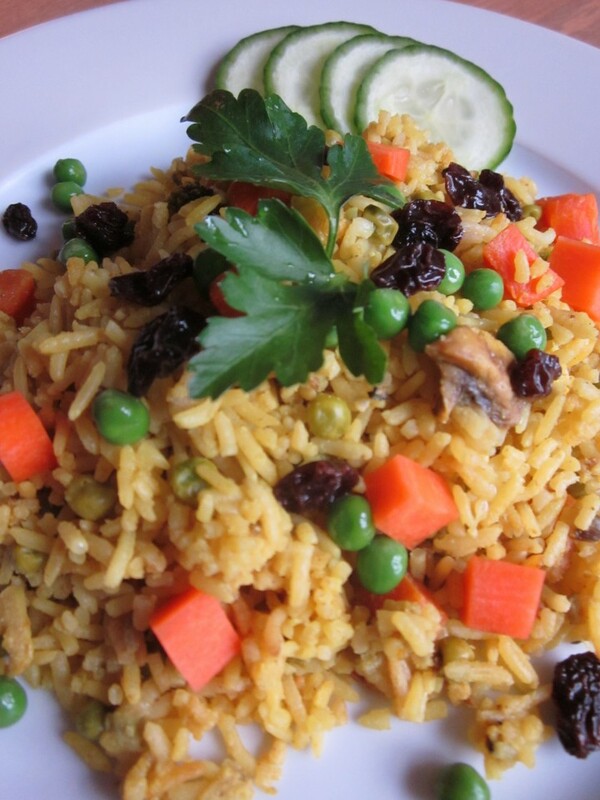 When pilau rice is ready, mix some raisins (optional) and serve immediately. NOTE: Do not use raisins if you are having autoimmune problems. It is better to avoid all dried fruits and nuts in this case. You can also use basmati but I prefer jasmine rice.